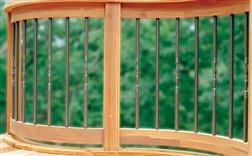 Aluminum balusters for decks, porches, or stairs. High quality powder coated finish over all aluminum metal. Styles include round, square, and face mount.